Metheny Music Foundation chairman Mike Metheny and the Foundation’s 2013 “Knight Award” winner Patrick Graham. 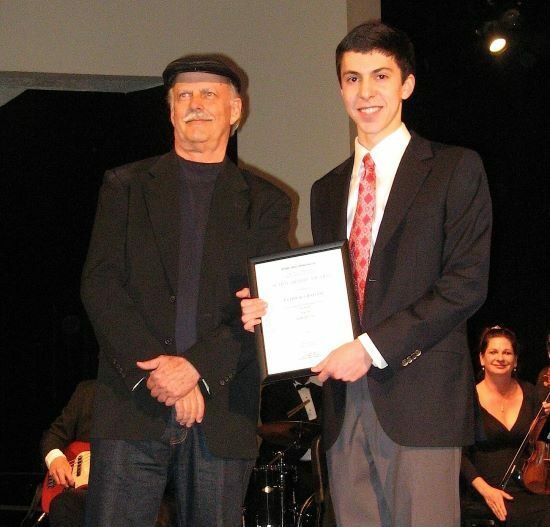 As part of the Family Pops Concert by the Lee’s Summit Symphony Orchestra on March 9, the Metheny Music Foundation’s first ever college scholarship was presented by board chairman Mike Metheny to vocalist Patrick Graham. Graham is a senior at Lee’s Summit North High School and plans to be a college music major this fall. The Metheny Music Foundation’s “Knight Award” is a $2000 scholarship named after the late William R. and Lorene Metheny Knight, uncle and aunt of Foundation board members Mike and Pat Metheny. Like the Metheny brothers, Lorene was a native of Lee’s Summit and a 1935 graduate of Lee’s Summit High School. 2013 also marks the seventh year the Metheny Music Foundation will award summer studies scholarships to Lee’s Summit music students. Those winners will be announced in May.